This lovely town house is situated in a very quiet urbanisation with a lovely pool area, there is also a communal BBQ area within the urbanisation, the house comes with a 304M2 plot of land at the side of the house and you are a stones throw away from the pool. 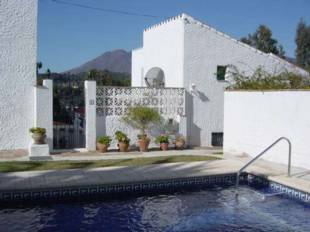 From the upstairs terrace you have sun all day with beautiful views to the mountains and a large private terrace at the entrance of 30M2 with a large store room. Even though you are in the heart of the countryside you are still only a 7 minute drive to all amenities and the beach. High quality townhouse built on the beach front, with marvellous view to the Mediterranean sea, Gibraltar and the northern most point of Africa on the horizon. The townhouse offers marble floors, alarm system and video answering device, safe in master bedroom, fully fitted kitchen with electrical appliances. You will be 40 km. From Gibraltar airport and 80 km. From the airport at Malaga, 20 km. 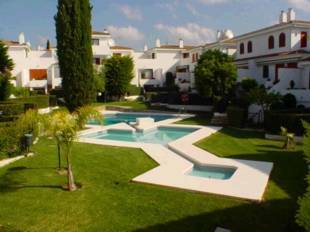 From Puerto Banus and just a few meters from the sport marina in Estepona. 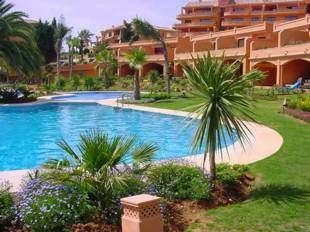 ALBAYALDE: Lovely corner townhouse located 500 meters from a beautiful sandy beach on the new golden mile. This house is built on three uneven levels with two bedrooms and a bathroom on the ground floor, living room with fireplace, kitchen and terrace overlooking the garden and pool on the main floor and master bedroom with en-suite bathroom on the top floor. Gated community. Sold furnished. REFURBISHED SUMMER 2005. 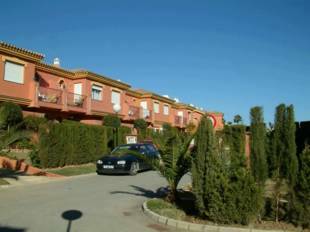 Townhouse, Residencial, Fitted Kitchen, Parking: Garage, Pool: Communal Pool, Garden: Private and Community, Facing: Southeast Views: Sea. Features: Conveniently Situated for Golf, Conveniently Situated Schools, Conveniently Situated Tennis, Fireplace, Good Rental Potential, Landscaped Gardens, Lounge Dining Area, Marble Floors, Sought After Area, Sunny terraces, Tastefully Decorated, Walking Distance to Rest., Walking Distance to Shops. This spacious townhouse is located within a gated residential area close to San Pedro. The property has been built across two levels and offers three bedrooms, two bathrooms, living room, fitted kitchen and private garden. The community has gated access with each property having off-street parking and communal pool area. The location is within walking distance of local amenities and only a short drive from San Pedro. 3 bed townhouse situated in popular Bel Air urbanisation, only 2 minutes to all amenities and 10 minutes to the beach. 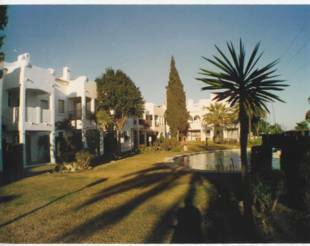 Bel Air is situated between Estepona and San Pedro on the main coast road. Property is 15 years old, but has recently been totally reformed with new kitchen, bathrooms and polished floors. There are three terraces, two of the main bedrooms and one leading through from the lounge out to direct access to the communal garden and swimming pool.